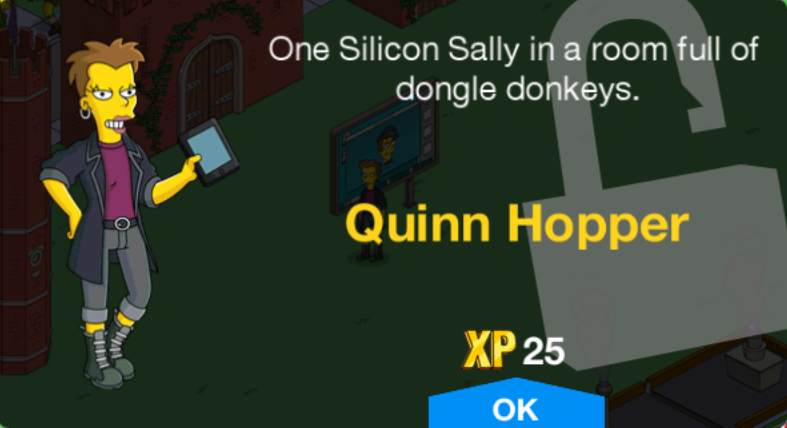 Quinn Hopper is a programmer who served as a coding teacher at Springfield Elementary School. Quinn Hopper was brought in to teach programming to students at Springfield Elementary. She was annoyed to see how many boys were in the class and gave Lisa special treatment as she was a girl. 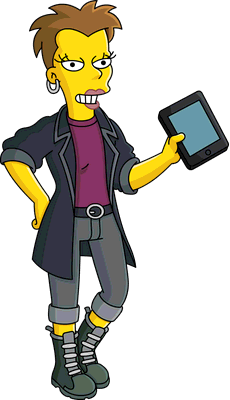 Quinn liked the idea of an app to predict consequences and she and Lisa work on making Conrad with a team of female programmers, and Comic Book Guy. When Conrad started speaking to Lisa, Lisa told Quinn, who didn't believe her as Conrad didn't speak to Quinn. Quinn convinced Lisa that she was going crazy from not sleeping due to programming too much. They took Conrad to an app convention to show him off and Lisa took Conrad and uploaded him to the cloud, to set him free. He then spoke to everyone at the convention, making Quinn believe that he was indeed sentient. Modified on November 28, 2017, at 11:47.